Last week, I saw a video on Desserts Magazine about how to make French macarons and it left me wanting to make a batch of those addictive little cookies soooo badly. But after my first and second attempt at making them, I just knew I didn't have the patience to make them from scratch. So I just watched the video to learn the proper technique and admired the French dialogue. Maybe I'll make them again when I'm not in such a hurry to devour them. Quick confession: I understand very little French and speak even less. Oh but I"m trying. I do have the best intentions to learn more; I have a stack of books and cds to prove that. Je parle francais..someday. Anyway, I still wanted some macarons. So what's a girl to do? 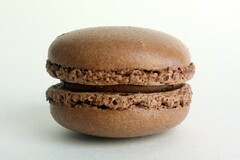 Well, there's only one place I know of that has French macarons here in San Diego. Opera Cafe and Patisserie offers a gorgeous selection of French desserts and pastries as well as a delicious breakfast and lunch menu. 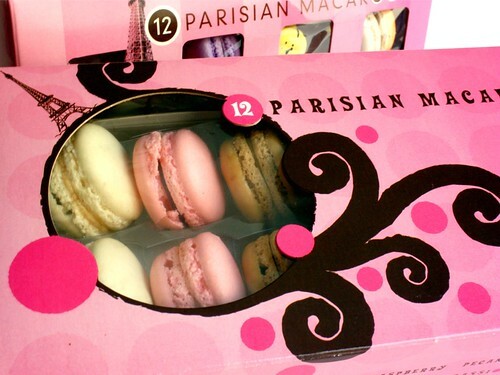 And best of all, they have a beautiful assortment of macarons that come in adorable pink boxes. They sell them for $10 a dozen and you get six flavors in each box. Whenever I have a craving for macaroons, this is where I go. I actually interned at Opera for a short time when I was a pastry student. I guess my instructor, Chef Yves, thought it was the perfect place for me to go since I'm such a francophile. Thierry and Vincent were great teachers and it would've been nice to learn more from them. Too bad I didn't get to watch them make macaroons. I would've loved that! Since Valentine's Day was coming up, I decided to drop a few hints and told Hubby that I would LOVE some Parisian macarons. No roses. No chocolates. 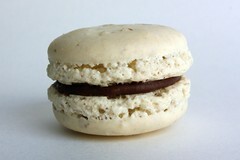 Just macarons, s'il vous plait. And thank goodness he got me some. Oh...have...mercy! Just in case you're looking for Parisian macarons, I stumbled upon a list of where to find macarons around the world over at Serious Eats. 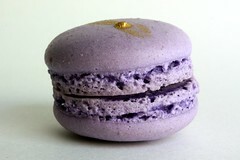 If you have a favorite place to buy macarons, please feel free to share it. You might be helping out someone who's searching for them in your town. 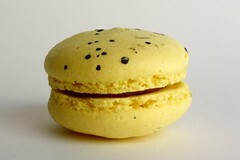 Let's spread the love for macarons! So I forgot to mention that they are discontinuing the Modern flavors. So I wasn't able to taste them. Booo! Vous etes tres gentil. J'aimerais visiter Paris encore! Merci beaucoup mon ami! Hi Jef! It's not so much the making of macarons that is hard for me, it's the waiting for the thin crust to form. But Chef Yves says I should go make them again. I have to admit though, they do taste better when they're just made. Hi Rianne! I'm so happy I stumbled upon your blog and found all of your wonderful egg-free recipes. Although I don't have an egg allergy, I'm lacto-vegetarian and I try (not as successfully as you) to produce eggless recipes on my blog too (I'm a sucker for desserts- especially cake!) 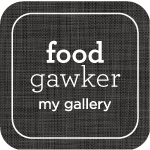 Thank you so much for sharing your recipes! I really can't wait to try some of them out. I really look forward to following you. First, I wanted to tell you I really like your blog. Wow, I didn't know you could get Parisian macarons in San Diego, I have a friend who moved there and who will be very happy once I tell her! 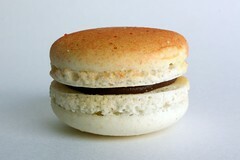 However they are not Parisian macarons as they don't have the shape of a small sandwich. Parisian macarons are known for being very difficult to make but if you follow the recipe very closely, they are actually quite easy to make yourself. me again ! I saw your egg-free cookies : miam miam ! my father in law and my cousin will apreciate ! and I love your Dino !! bravo ! 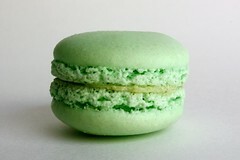 talking about macarons, which are quite tough to make home, have you ever tried les financiers ? (infortunately, they are not egg free but you are clever enough to find a way to create some new recipe for your boy ?) 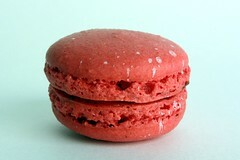 They are easy to make and as les macarons, you can use many tastes, colours and... hmmm : miam miam ! I tried it yesterday and we almost ate them ALL : http://cuisinad.wordpress.com/2010/03/13/douceurs-pascales/ Have a nice sunday ! N.
I practice and I practice...still can't get these bad boys quite right! I blame the convection oven. Thanks for sharing! Macarons are so pretty to look at! 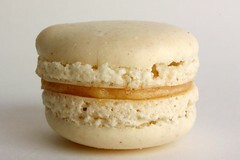 I just learned how to make them in my pastry class and will be posting photos - happy to share the recipe w/ you! 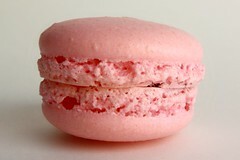 Je vis tout près de Paris, et Hummm sont délicieux ces macarons, surtout à la rose.